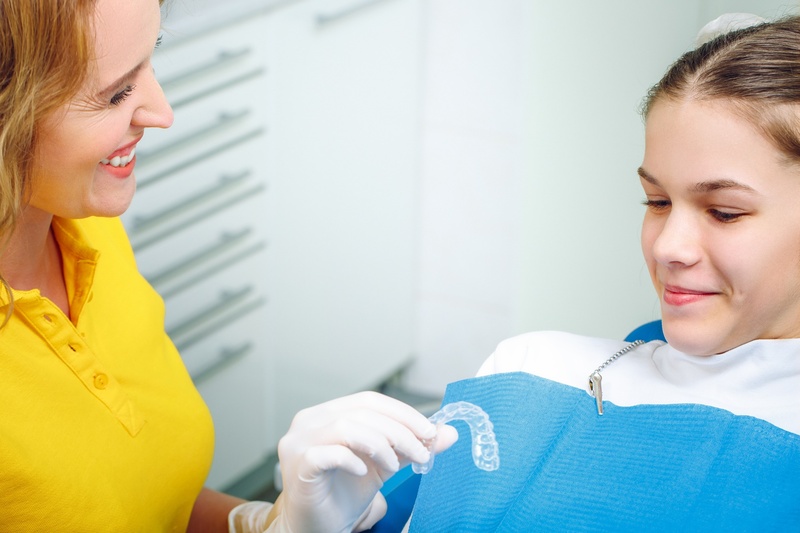 While braces technology has evolved to accommodate all mouths, they require daily maintenance to ensure they work their best and remain as secure as possible. To preserve and enhance your braces, below are three common orthodontic accessories that you can try. This type of wax safeguards the inside of the mouth from the wires and braces brackets. Made of a natural wax like beeswax, paraffin, or carnauba, this product is applied directly to the end of the wires or brackets that are causing discomfort. Their purpose is to shield the sharp edges from piercing the inside of the mouth. It’s nontoxic and safe to use. A floss threader is a disposable tool that guides dental floss under and over the braces for easier and more effective cleaning. While it requires a bit of extra time and effort compared to traditional flossing, a threader accesses the tight spaces around the braces and thoroughly cleans them. This product is available at any pharmacy or discount store. If you play sports or maintain an active lifestyle, a mouthguard protects the braces and teeth from damage and injury. Mouthguards for people with braces generally have more room than those designed for the general population, allowing enough space for both the teeth and braces to rest comfortably within the barrier. To be fitted for a customized product, consult your dentist. If you wear braces, the above items should be necessities in your oral care toolkit. BridgeView Dental Group in Kodiak, AK, provides comprehensive orthodontic treatments, including braces and mouthguards. They also provide a wide range of general dentistry services, from exams and X-rays to tooth implants and root canal procedures. Schedule an appointment by calling (907) 486-3257 or visit their website for more information about their orthodontic services.